As you drive by Downey's newest shopping center, you'll see the tall sign that lists some of the stores that are part of the center. At the top of the sign is a logo—"Pd" surrounded by stars. 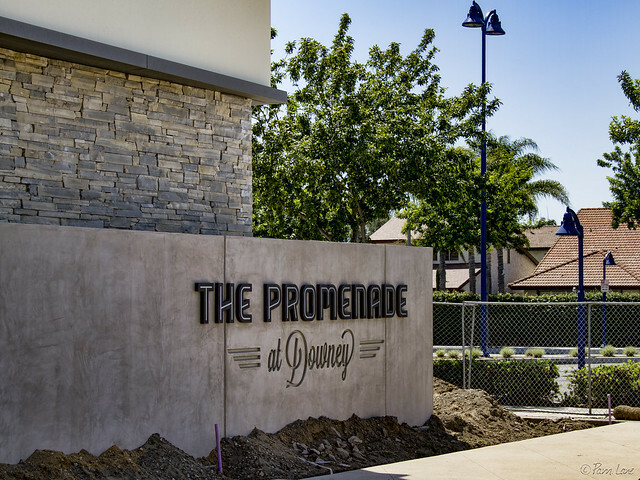 It's only if you drive into the parking lot, near the base of that sign, that you see that "Pd" stands for "The Promenade at Downey." A promenade is a leisurely walk, typically in a public place. The name conjures up images of strolls through appealing settings. So far, there's not much evidence of this, but with many areas not developed yet, maybe I'm expecting too much too soon. Well put. Hope springs eternal ... and is sometimes unfulfilled. So far the "Prominade" looks like the Long Beach Town Center (Carson and the 605).